One of the reasons that I decided to start a blog in the first place is that I was having so much fun reading so many others! I have a folder in my favorites just for RV blogs and I think I'm up to about 35 blogs that I read on a somewhat daily basis. I love reading about other people's journeys around the country. Many of them include pictures of the places they are seeing along the way. It's great. It helps me imagine some of what our life will be like when we are able to get out there and see these places. Even in just 4 years, even though at that point we won't be able to full-time yet because Harry won't have retired. Once we buy the fiver sometime in 2014 hopefully, we plan to use it for vacations, and maybe even long weekends. We can learn about how the systems work, and get whatever kinks out, before we head out on the road for good. But reading blogs has also turned out to be such a great research tool. First of all, I love the ones that talk about the campgrounds that they stay in. Many times they'll just say, we stayed in campground such and such. Sometimes they'll provide a link, sometimes they don't. (I haven't yet had a chance to figure out how you do that.) But even when they don't, if the campground sounds nice, I'll do a quick search for it and find the home page. And then off into my campground favorites folder it goes. I think at this point I have about 40 campgrounds bookmarked. What I'm going to do at some point is put sub-folders in there for regions, and then break down each sub-folder further into states. I'm only now getting to the point where I'm thinking about doing that because my campground list is starting to get a little long. I'm not in a huge hurry, after all I do have 4 or 5 years before I'll be needing to actually use that folder! LOL I have a rainy day project all ready for one of these days. One of the best I've found is Margie; her blog, Bruce and Margie's full-time journey" is on my blog list here. (I know there's a way to label a link, but since I have the address on my blog list I won't try to figure that out now.) 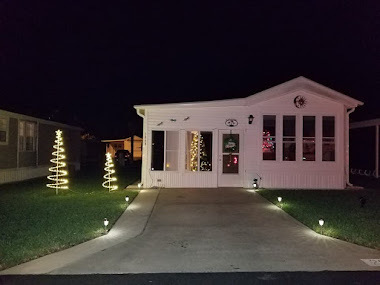 She gives great RV park reviews, with the link to the home page. Thanks Margie! I have gotten a number of the campgrounds in my folder from your reviews. The other info that I get from blogs that people write is types of products that will be good to have. I thought of this today when Dee, who writes a blog called Tumbleweed, (which is also on my blog list), talked about a surge protector they use that protects them from either too much or too little electricity. So into my RV products folder that one went. I am hoping that all of this research will save us from having to learn things the hard way!! Well, it's time to get ready for our biking excursion. Have a good Memorial Day! Welcome to Laurie, my first follower!! :) Thanks for your note on the RV dreams website as well! Well, today definitely did not end up being half work. After breakfast, we began painting in the upstairs bedroom. It went more quickly than we had expected. By 10:30, we had all of our priming done. Then we cleaned up, and started getting ready to head over for the picnic. In the meantime, I had a little time, so I went to work on the computer typing up our list. The complete list ended up being about three pages long! It isn't three pages to go though - because I also added things that we have already accomplished. That way we will have some things to cross off when we print the list off. Some of the items on here include painting the rooms that we haven't finished yet, cleaning out the closets, cleaning out the garage, adding shelves in the garage, cleaning off the work bench and adding shelves over the work bench for organizing. Most of the tasks on our list only involve our own time and effort. About the only thing on the list that actually involves any kind of substancial financing is a redo of the cabinets and countertops in our kitchen. So that's the list, and hopefully having it all on paper will help us be more organized, but also give us a sense of accomplishment as we get things done. Well, maybe not half work. It's 7 am and we've already been up for almost an hour. Even though it's Sunday, and I rejoiced last night that "we don't have to get up early! !," the reality is that we almost always do. First of all, it's pretty hard to sleep past 5:30, 6 because around that time Ariel, our littler and more personable kitty, will decide it's time to come up on the bed for her morning head scratching, and to remind us that it's almost her breakfast time. That cat must have a clock in her head, because she always comes in at almost exactly the same time. Sometimes we can give her a few pets and go back to sleep, but today, as soon as I was halfway awake, the items from the list that we want to work on this morning started running through my head. We only have this morning to work on the painting because we're going to a picnic this afternoon at a friend's house. So.....here we are up!! Harry is cooking me breakfast right now and then we will head upstairs for a rousing couple of hours of painting before it's time to shower and head out. I did take some pictures yesterday to show some of the "before" stages in the house. But I wish I had taken some a while back to show the true changes - we have already made quite a few so I guess it's more the middle stage than the beginning. Well, enjoy your Sunday everyone! It's going to be a beautiful one here...and hopefully tomorrow I will have pictures from our first bike ride of the season to share. Happy Memorial Day, in case I don't post tomorrow!! A big thank you to all of our servicemen and women out there!! I had to go to work this morning. My workplace has limited hours on Saturdays, so at least it was a shorter day. And since Monday is Memorial Day, I still have 2 days off coming up, so that is a good feeling. Well, I'm off to take some pictures of the house, so that when we do get our to-do list accomplished, I will have some before pictures to compare to the after ones!! It's been a really busy week, and I'm not exactly sure why. We had Monday off as we were traveling, so we've really only worked 3 days so far. But I haven't even had time to read all the blogs I follow, much less write on this one!! I left off writing about the type of RV we're looking at....well, after traveling to many RV shows and checking out lots of websites...we have decided to purchase our fifth wheel from Nuwa (pronounced New Way). This seems to be a great company, with a leader who actually cares about his product and the people who use it. There are many reasons why we've made this decision. What drew us to it in the first place was the craftsmanship of the RV. Their site has a lot of video tours so you can actually see the features of the coach. Then my husband watched all of the videos they post about how they construct the RV; they talk about the materials they use and why they believe this results in a better product. That was the beginning of being attracted to getting a Nuwa Hitchhiker. After that I joined the Nuwa owners forum - they encourage people to join even if they're only a wannabe owner!! This is where I've seen how committed Nuwa is - as their CEO actually responds on the forum quite frequently to questions, or asks the members their opinion on changes they may be making in the product. We are firmly in the Nuwa camp now. The only question is which one we will end up buying - which floorplan, etc. Our plan at this time is to take a trip to Kansas, probably in 2012, where the Nuwa factory is located. They have all of the models available there, and also provide tours of their factory. So we will probably make that trip before we make any solid choice, although I do have one I am leaning toward based on the information I know now. As far as purchasing, we will have (if all goes well) reached our goal for savings sometime in 2014 - so right now that is our target date for buying. We headed home yesterday, leaving Burlington around 10 am, which got us on the roads after rush hour. It was a beautiful day for traveling, with blue skies and nice puffy white clouds. I tried to see the ride with my new "blogging" eyes, although this is a route I have traveled so many times I barely pay attention to the "scenery". It's a little strange I guess how a certain pattern of hills and curves can become so familiar. This area has a lot of small bodies of water, but I don't know if any of them are named. It was a pretty uneventful trip, and took us about two and a half hours. Once we arrived home, we unpacked, did laundry, all the mundane things that one must do after returning home from a weekend away. I wonder how different it will be when we are traveling with our home with us? I looked over the weekend for campgrounds in that area. Although we won't be restricted by our work as we are now, it seems that we will be a little tied into the seasons, as campgrounds up in this area don't seem to start opening much before April, or in some cases, May. And they start closing up around October. So we will have to plan our family times around the warmer months, unless our family moves south!! We had a great day that consisted of both relaxation and a little exploring too. Discovered a great park only 10 minutes away from our hotel. After a leisurely morning, we decided to go over and spend a little time getting some fresh air and exercise. It really was a beautiful day. The forecast had called for cloudiness and mid 70s, but it ended up being closer to 80 degrees. There were some beautiful trails here. Its been a while since we have been hiking, and it was so great to be in the great outdoors! We keep saying we are going to do more hiking and biking - this summer we are determined to make it a priority. I thought this tree was really pretty with the stonework around its foundation. Along the path there were markers, and descriptions of places and people from the opening of hostilities in the Revolutionary War. We didn't take pictures of most of them, but they were interesting to read. I thought about the fact that some of the trees surrounding us may have been standing during those times as well. This house was the only standing one along the path. The rest of them were just ruins, or the remains of a foundation. Today it's back to the capital region for us. We are having a relaxing morning in our hotel room, but soon we will be packing up and heading home. Today we are in Burlington MA. We are going to go check out Minuteman National Park this morning, which is about 15 minutes from where we are staying. I will probably take some pictures - will have to see if I can figure out how to upload them to this blog. Glad that Friday is here! The week has gone fast as usual, but it's still nice to have Friday back again, and a long weekend coming up. Tonight we will head to Burlington MA for the weekend. That is where Gretchen, Harry's daughter, and her family live. Also this weekend we will be attending the graduation from Graduate School of Harry's son, Andrew. Tomorrow will be a pretty quiet day we hope. We are going to check out Minute Man National Park. On Sunday is the graduation, and the next day we will be returning home. No word from our potential buyer on the pop-up, so last night we listed it for sale. We have already had one email asking for more information. Fingers crossed for a quick sale!! I go in to work later on Friday, so I am going to do my good health deed of the day, and go walk. No news on the sale of the popup. We will probably give him a few more days to make up his mind, and then we will start advertising it for sale. I am hopeful that we can sell it relatively quickly - it is in great shape, and has been gently used. Went to the dentist today. I was thinking about how that will all work when we are full-timing our way around the country. Although both Harry and I are excited about traveling the country, being debt-free, exploring natural beauties and sharing these adventures with each other, there is still a little apprehension at times at the thought of being far away from the medical professionals we know and are comfortable with. I try to look to the future with hope and trust - of course none of us knows what will come on any given day, and I try to make the choice not to go through life with fear. Not too much going on these days. Our potential buyer came over yesterday and checked out the popup. It seemed like he was interested so we will have to wait and see whether it turns into an actual sale. Other than that, its been quiet, with the days filled with the usual - work, laundry, cooking meals etc. Yesterday Harry took the day off and got some things done around here. He also used the time to investigate a leak we just discovered in the basement coming from one of the water pipe areas. We have a plumber coming on Thursday - hopefully whatever it is won't end up being too expensive. We are going to take advantage of having the plumber here to have him replace the faucet set in the upstairs tub. The piece that controls the cover to the drain (there's probably some official name for that but I have no clue what it is) broke awhile ago, and has been covered with duct tape ever since. We knew we would have to get that taken care of at some point, so might as well be now. We've made a lot of improvements in the house over the past year, all with a view to increasing the value for when we sell it. Right now our major goal is to become debt free - well except for the mortgage - that won't be gone until we sell. There is a lot to learn about blogging. I am still working on the layout of my page and trying to figure out how to change it to look the way I want. I guess it's a good thing that I'm not planning to show this to anyone except Harry for the next few months at least! Harry doesn't think there's enough going on in our lives right now to warrant a blog anyway. We shall see. At least it will give me the opportunity to explore this site until I am ready to put it out for public consumption!! Harry is outside right now testing all the systems on the popup. It's strange to think how getting rid of the first bits of "stuff" could be exciting but it really is. It seems like the first step to clearing out all of the extraneous stuff that we hang on to just because there's room in this house for it. That's definitely on my to-do list for the summer months that are coming soon - starting to sort and purge things that are just hanging around. This whole topic reminds me of the saying that if you haven't used something in a year, then you don't need it. We have so many things that fit in that category. Tomorrow hopefully the buyer that is coming to check out the popup will want it, and that will be another bit of "stuff" gone.